What’s the Project? 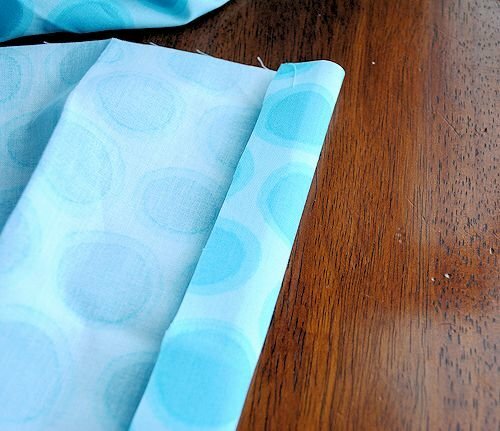 When you’re sewing a project and you need to know how to insert elastic (for example into a waistband), here’s a simple tutorial that will walk you through it. Hello, my sewing friends! 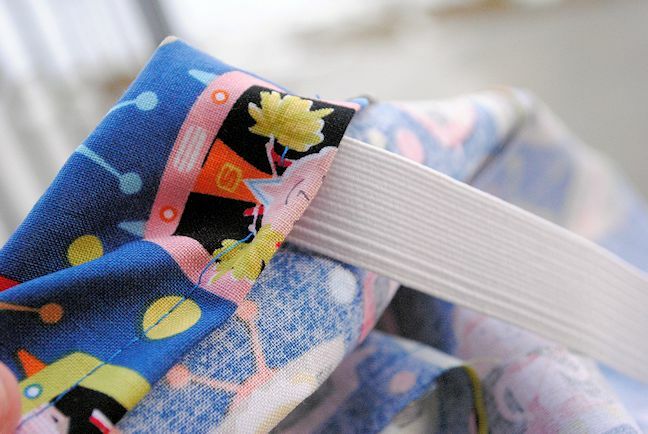 It’s that time of the week again-a new sewing lesson for the Learn to Sew series! It’s week 4 and this week I am teaching you how to sew a casing for elastic and then how to insert elastic. Perfect for making things like pajamas and kids clothes. And it’s not too hard. 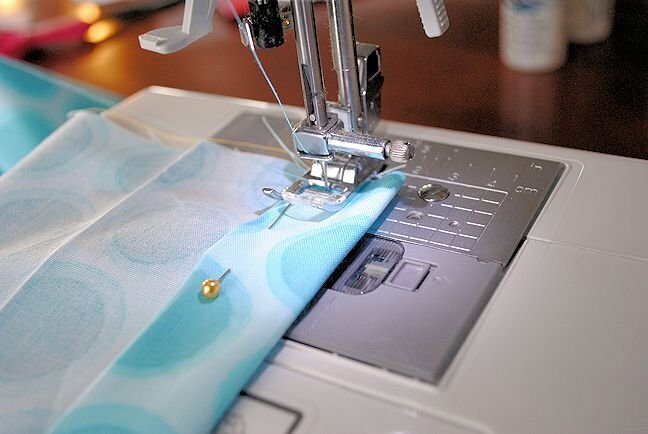 In fact, if you have completed weeks 1-3, you have learned the most foundational skills for sewing. Everything from here on out is just the fancy stuff. So congrats on completing that! 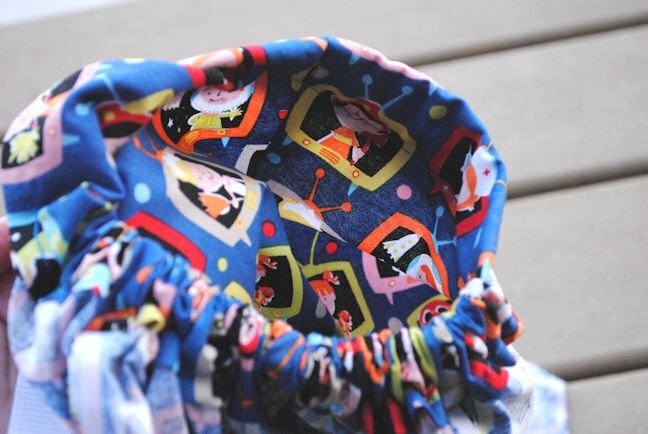 What I am teaching you today will help you so that you can sew things like pajama pants or little skirts or anything that you want to add elastic to. 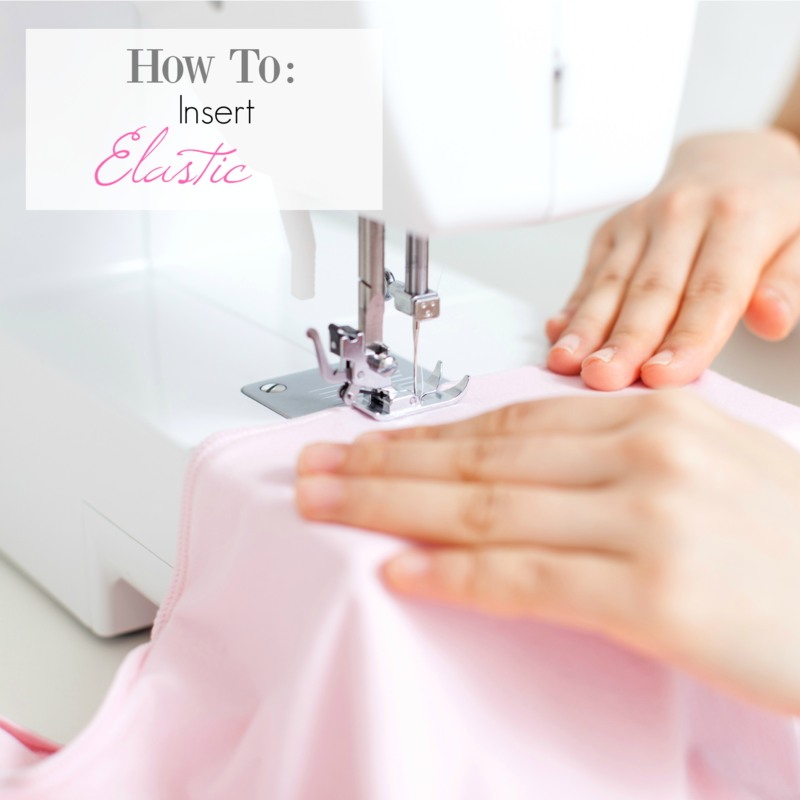 It’s a very easy way to add elastic and really only involves a hem and a straight stitch. Can you handle that? I know you can. 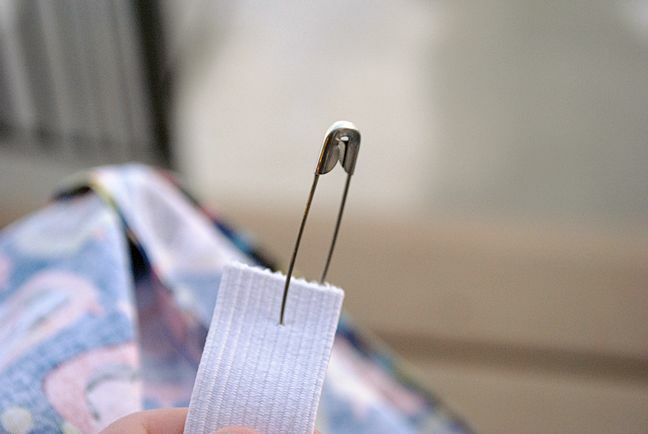 And pull it through using the safety pin to pull on and guide the elastic. BUT, make sure you don’t let the other end of the elastic pull through the end you started on. You can pin it in place or just hold onto it, just don’t let it follow through the hole. OK, so those are the basics of how to do it. But, generally you aren’t going to be doing it on a flat piece of fabric like that. 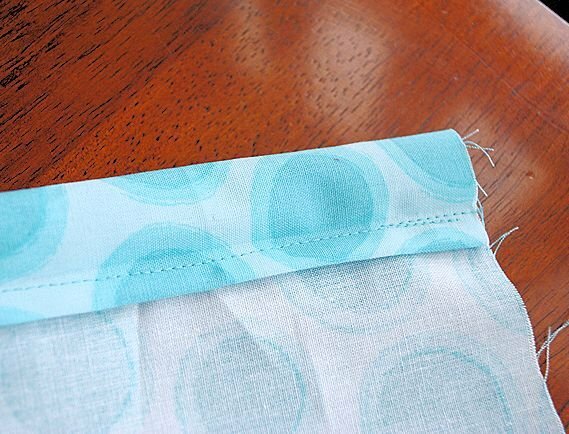 Usually you are going to be inserting it into a waist band, so your fabric is already going to be in a loop. Let’s imagine you are doing pajamas (one of the project options for this week). 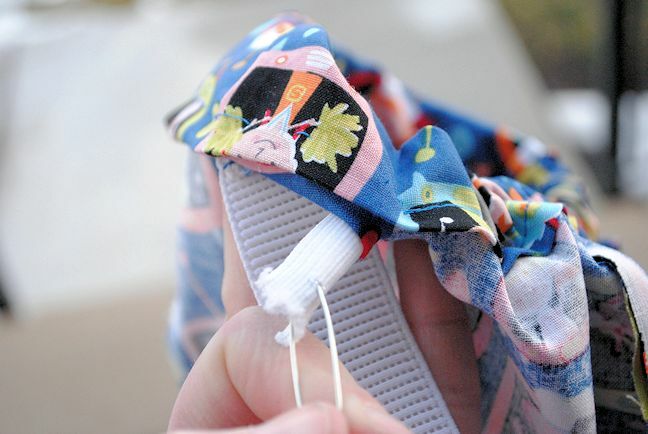 You’ve already sewn the pajamas together, now you just need to create the elastic waistband. Make sure that your elastic did not get twisted up inside. 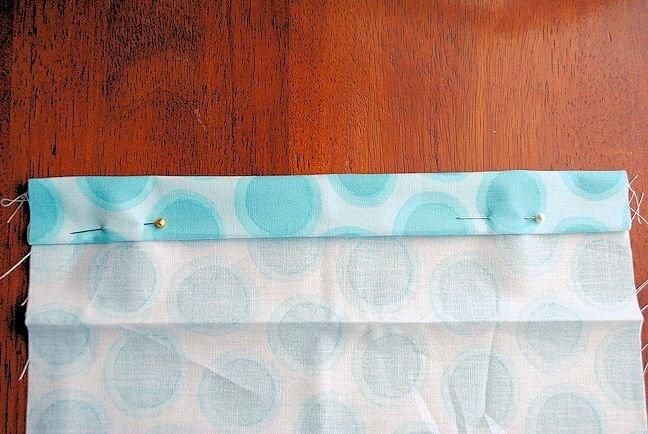 Then sew those two ends of the elastic together. 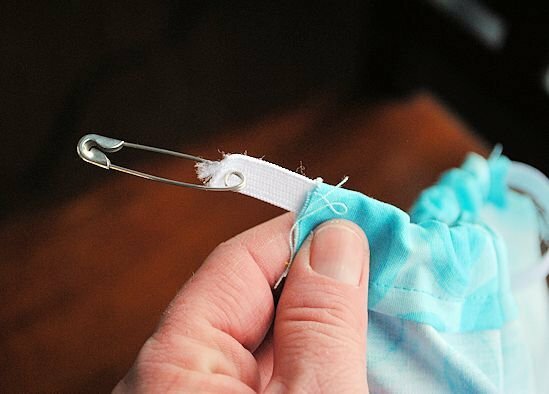 Either use a zigzag stitch to do it or just go over and over and over it about 10 times to make sure it is sewn tight. I must admit I didn’t manage to complete last week’s project. I caught some kind of flu bug or something like that and spent a few days in bed with no energy to do anything other than dream up more options of how to improve my hypothetical/potential handbag! The good news is that I have all the fabrics chosen and a general idea of how to put the bag together. Just missing a tiny piece of hardware (for a key fob, which I thought would be handy) and I’ll finally be able to get started! I’m also looking forward to trying out the elastic thing! I’ll have to get some when I’m already over at the store. Thank you for offering a pyjamas tutorial in addition to the girl’s skirt! The skirt looks cute—but as you say, not everyone has a girl in their lives to give it to. Wow, thank you for this great tutorial. Im so excited! Im getting ready to do the skirt and I cant wait to do the pajamas. One question, when measuring out the elastic, do we use the exact measurement of the waist? Or do we cut back some? Okay, one more question, when sewing the elastic do we lay the elastic side by side and zigzag or do we lay it on top of each other? Sorry, I’m a newbie at these things :) Thank you so much for these classes! The tutorials are awesome! I measure the elastic just shy of my kid’s waist. Hmmm, I don’t think I have that in there do I? I should fix that. Do you mean when you are done threading it through? Just put one piece on top of the other and sew through them but not through any fabric or anything. Yes. After threading the elastic and thank you for answering :) Baby skirt, here I come!!! Thank you so much for doing this series! It has been so much fun to follow along! I don’t have little girl to wear this adorable ruffle skirt I made, so I will probably add it to my Etsy shop, but it’s been so much fun playing along! Thank you again! I am really enjoying this series. 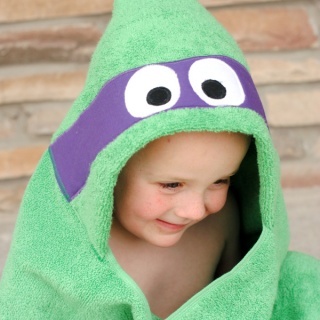 I just finished the hooded towel (just a little behind on them). Have made several little girl skirts so I am going to do the PJ pants. Thank you! I’m so excited to do this one! I’ve been wanting to do a skirt for my daughter, and have had the fabric (and elastic) for about 6 months. Just haven’t had the courage to actually do it! Now I can’t wait! Thanks!!! I’m definitely doing the skirt! My daughter will love it for spring! Thanks for this great series. I made a skirt for a friends daughter. Loving all the tips. I am working on the three layered skirt. I have been looking for that pattern for a while now! I’m a little nervous about calculating the length and width, that’s where I always mess up! I hope it goes well. I’ve done my best to give you directions to size it up but I haven’t tried it out myself. Good luck! Can’t. wait to get home and sew the skirt!! Was going to do the cute skirt bit bought the wrong amounts of material. Oh well, I have a set of jammy pants that are already cute that are calling my name! I am really enjoying your series! It has given me the push to try several projects of your’s I have been eyeing but haven’t had the courage to do! Greetings from snowy New Hampshire! I have been following your “learning to sew” series and have really been impressed! Great job! I do have one thing that you might want to mention regarding inserting the elastic. Be sure that the elastic does’t get TWISTED when inserting it into your casing. It feels horrible around your waist if it’s twisted. Again, great job on your series. I look forward to more. Good point! I will add that. I have most definitely done that before! 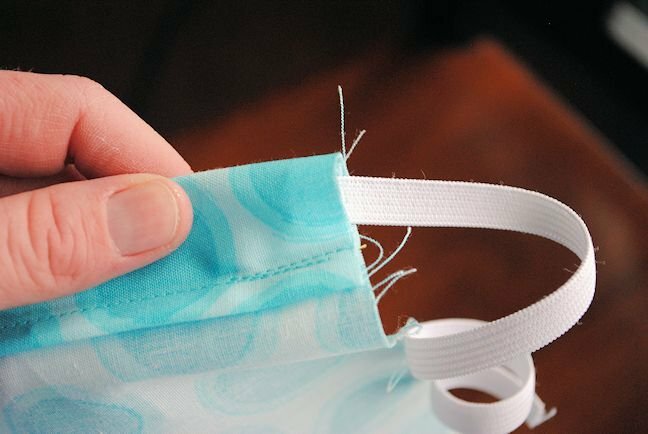 To help keep elastic from twisting in casing after you have put it in and finished sewing it all up, stitch over the casing and elastic down each seamline – front – back – and side seams right in the ditch. You won’t see it, and it really helps to keep the elastic from “rolling” in a casing. Enjoying your tutorials. 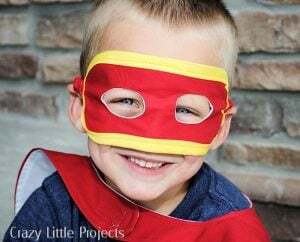 Even though I am not a beginner but rather an intermediate in sewing children’s clothes, I am finding your very clear tutorials helpful. Good reminders. There is one thing I always get wrong when sewing elastic. When sewing the two ends together how do you ensure that you won’t get a tangle/twist. I make sure that the elastic is flat all the way around but somehow when sewing the ends together I always twist it and end up having to cut off the sewn ends and do it again. Any tips? If you just lay one on top of the other and sew you should be ok? Although I have to admit that I do it too. I had my own pair of p.j.’s that I started making long ago. So with your easy guidance I was able to put the elastic in. It was so easy! Now I just have to get them hemmed and they’ll be all done. This skirt would make a cute shower gift! Thanks for the latest lesson! I made the skirt and it is sooo cute! Wish I could post a pic for you. My DD is wearing it now! Great tutorial. Can’t wait to try this out on a skirt for my daughter! I made the skirt and it was going well until I did my last seam up the side. Somehow my fabric shifted and my layers don’t meet up. Next time I’ll sew each layer into tubes individually before attaching all 3 together and creating the elastic casing. 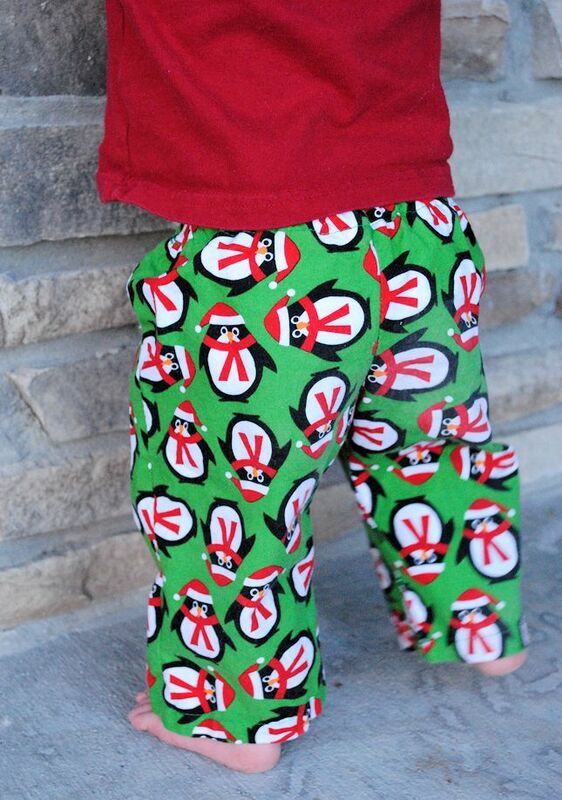 I’m definitely doing this one again (and going to attempt the PJ bottoms for my son). Thanks so much for the great tutorials! 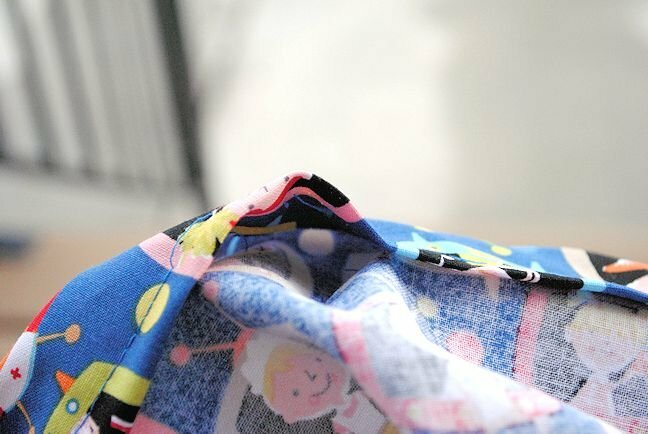 would you recommend using cotton for the pjs or can I use a knit fabric? which would be easier? Cotton will be easier to sew on but knit would make comfy pjs. Such a beautiful and simple skirt pattern! Perfect timing for me as I am looking for outfits to make for my baby girl. 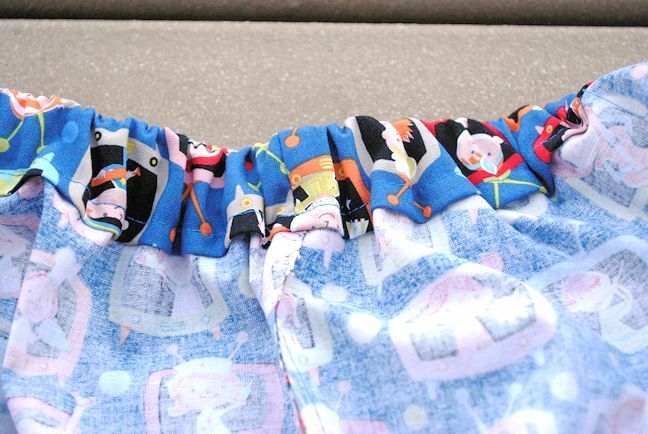 I just finished the PJ pants for my son, and I love them! For anyone who didn’t do them yet, I almost didn’t think of this but start the hem on the back of the pants or the inside of the leg so the “knot” isn’t as prominent. I’m going to make the skirt — funny this tutorial is this week because I am at the part where I am adding elastic to sleeves on a Rapunzel running costume for the Disney Princess 5k in February!! Oooh, I would love to win! 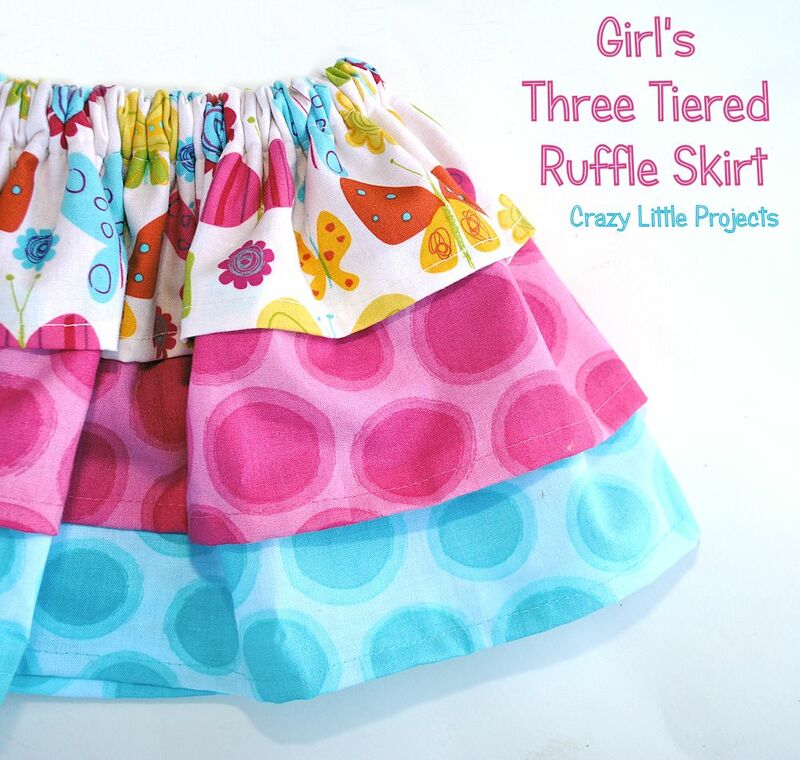 I love the three tiered ruffle skirt! I can’t wait to try the skirt. Just have to find the time! I’d love to try the skirt, but I’m sadly lacking in the little girls dept! That said, my little boys get lots of handmade pajamas! I’m lacking in the little girls dept. too but sometimes I just sew girl stuff anyway. Thank you so much for this series. I am a little behind but loving it all! Out of town guests will be gone in a couple weeks and I will be able to get back into things for longer periods of time. Just bought some toy story material and I am going to try and make my nephew some oj pants. So excited. I’ve started on the skirt for my little one (although I hve to admit I’m a little behind and just finished last week’s project)! Thanks for the great tutorial on PJ’s. Tons of fun to make, and very easy to follow. Going to attempt the skirt today as a gift, am I am looking forward to it! I’m making this into a Valentine’s skirt – can’t wait! I know…some people are having a hard time sewing through that many layers. But it sounds like you did great! This brought back great memories of my mom teaching me to sew. I loved threading the elastic through. 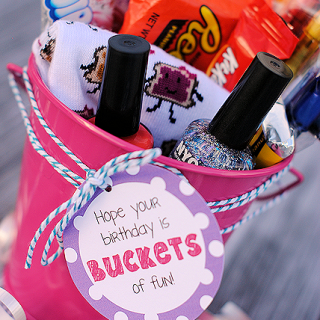 I think I did that for every project my mom made with elastic!. I LOVE finding new fabrics! does the five pairs of pj bottoms I made at Christmas count? I like your clear tutorials. Thank you for these tutorials. I have made each one each week and I can see my skills getting better. My ruffle skirt turned out awesome! I hope my niece likes it. I’ve really enjoyed the weekly lessons. Thanks for helping me refine my sewing skills! Yes! Done, and they even fit! I’m so excited! Just finished a pair of M&M Pajama pants, they are adorable on my boy!! Now on to this weeks project! I too am the mom of 4 crazy boys. I’m always looking for new things to make them. Love the pjs. Adorable. 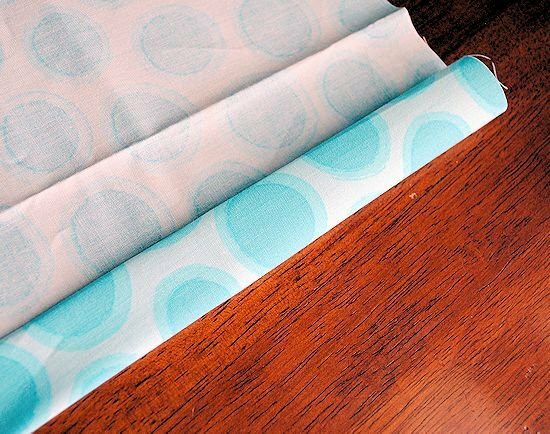 I want to make a table cloth will the same principle apply? A little confused with casing. So you start off with west but in your pictures after you’ve double folded it it looks like its right side out? Did you turn it or…are my eyes just wonky? 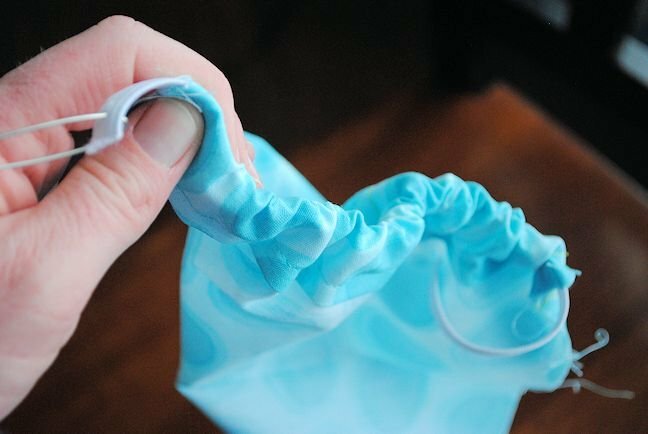 You will just fold it to the inside of what you are making and sew it and then thread the elastic through. I had enjoy your picture and the steps on how to use elastic. I am trying to add a one or two inch piece of elastic to “expand” my son’s snow pants. He just needs a little more room for them to go over his ski boots. How can I do this without ruining the pants? Thank you. I honestly have no idea! Sorry! I love Stitch Stash Diva!! 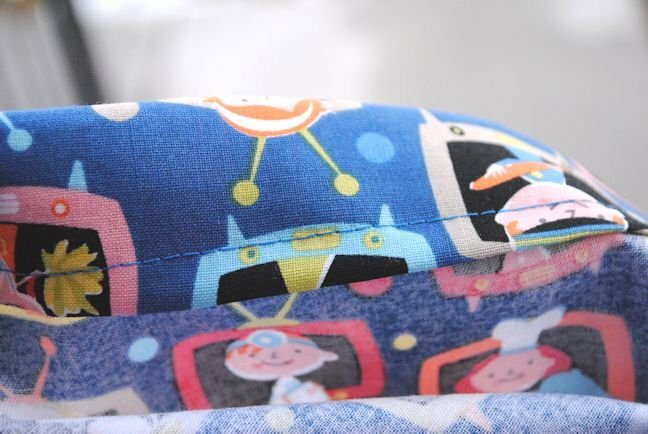 One of my faves is the Cars From Birch Organic Fabric. Out of all the sewing tutorials I’ve looked at, yours is my favorite. Thanks for breaking everything down and not assuming that some things are common knowledge!